14 years. 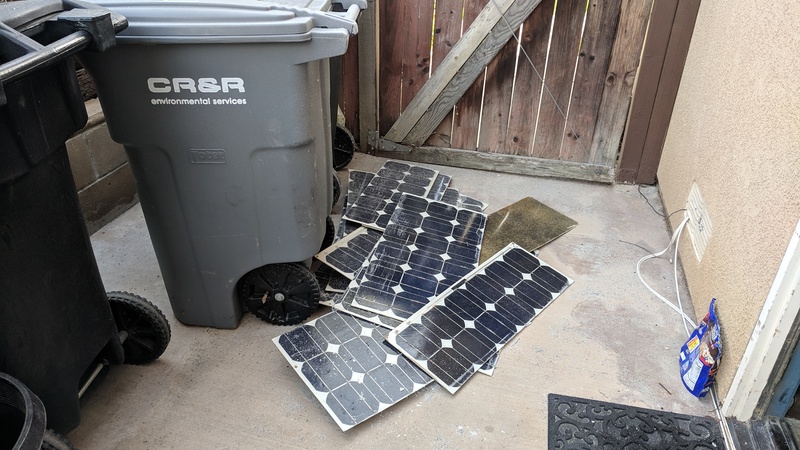 Fourteen long years I have been trying to repair these solar panels….. I mean they cost me some money and they are free energy, so there was a lot of incentive. But…. At some point, I just had to call them dead…. They beat me. They were off the Solar Sydney Sailor or some such vessel. They were flexible and made up a bit of a sail. Sure enough, the joints cracked. So they came up for sale. I figured that it would be a ‘simple’ matter of soldering the cracked joints. Yeah. Nah. First up, they were covered in silicon, so that had to be carefully ground away at each joint, then we had to clean the dust from that grinding. Then, we had to use flux to prep the ends of each solar cell. Once that was done, we could then solder braid from one cell to the next. All in all there were around 200 joints per panel that needed repairing. Stupidly (?) I was over confident and so we batched jobed the whole lot, so in other words, I ground them all, cleaned them all, then worked on one at a time to solder, so we were a fair way into the whole 10 of them before we found out that the repair was a LOT more problematic than it seemed. So what caused the hammer to fall? The lady next door sold her house……. She had some cabinets that Freddy saw and liked, so we agreed to buy/take them. The only place for them was in the garage, so I had to clean things out in a bit of a hurry because I did not want to park the cars outside while we did the clean up/ make room slowly. I have been tinkering with the solar panels all this time and making zero progress. We just had to admit that I could not do it, so we cut each one into three so that they would fit in the garbage. Good try Ben. I hate to give up on repairs to anything. Being a bit of a hoarder, I suppose! No one can accuse you of not trying!